I'll say this for Marvel. They have some problems, but they're also leading the way for diversity in comics right now. Their willingness to take beloved white male superheroes and transform them into minority and female superheroes is almost startling. They broke ground with an African-American teenage boy as Spiderman with Miles Morales. Then they created a female Wolverine, a female Thor, an African-American Captain America, an Asian-American Hulk, a female Muslim Ms. Marvel, and now the role of Iron Man will be taken over by Riri Williams, a teenage black woman. According to the announcement by Brian Michael Bendis in Time, the character will debut in Invincible Iron Man. At the end of the current crossover event Civil War II, Tony Stark will quit and turn over his role as Iron Man full-time. Williams will be a teen genius who impresses Stark by enrolling in MIT at the age of fifteen, and building her own Iron Man suit in her dorm room. It's unknown as yet how or why Tony Stark will give up his armor, but we look forward to new adventures with a new female hero. What I found most gratifying in the interview with Bendis was how he described the racist reaction online to the announcement. He said: "Some of the comments online, I don’t think people even realize how racist they sound. I’m not saying if you criticize you’re a racist, but if someone writes, 'Why do we need Riri Williams we already have Miles?' that’s a weird thing to say. They’re individuals just like Captain America and Cyclops are individuals. All I can do is state my case for the character, and maybe they’ll realize over time that that’s not the most progressive thinking. But increasingly we see less and less of that. Once Miles hit, and Kamala Khan hit and female Thor hit — there was a part of an audience crawling through the desert looking for an oasis when it came to representation, and now that it’s here, you’ll go online and be greeted with this wave of love." I love his response to people who say there are enough minority characters in comics. I've even heard some people argue that comics should have a specific percentage of minority characters that matches the specific percentage of minorities in the United States. But the same people aren't complaining there are too many white male superheroes. The anti-diversity trolls aren't saying, "There's already a white male Batman. Why do we need a white male Superman?" There's no quota that needs to be met. How about we just make the ethnicity of the characters a part of who they are and what fits the character best, instead of assuming it's about some sort of progressive social justice warrior affirmative action agenda? It's nice to know Marvel gets it. I also think the new character will bring a lot to the character. What does it mean when a woman is playing the role of Iron Man? Will she be trying to pass herself off as a male? Would her being revealed as a female change how people perceive her? Will she have the wealth and power of Tony Stark or will she have to be the technological genius with limited resources? Looking forward to it. 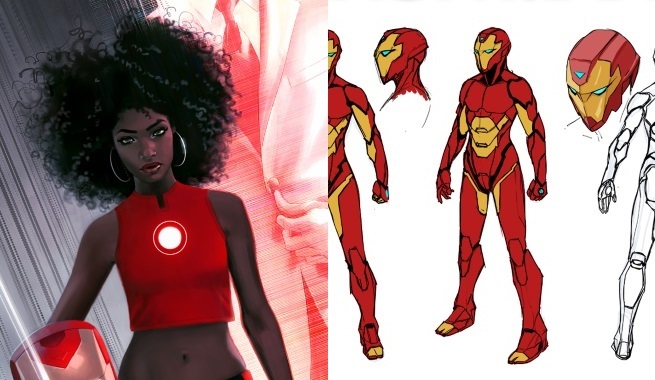 UPDATE: Her name will be Ironheart, not Iron Man. What do you think of the new Iron Man?